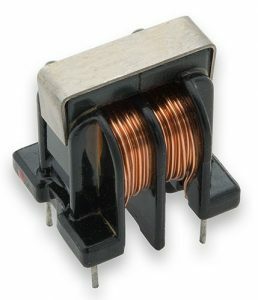 The common mode choke is one of the many types of inductors. Common mode choke is usually used in a power supply to filter out noise from the incoming line voltage. Impedance is the most important aspect of a common mode choke. The above formula give you the minimum inductance you need to achieve the required impedance. Step one: determine the wire size. Step two: select a core. Proper core selection is somewhat trial and error. A ferrite material with 5000 permeability or higher is commonly used. The core must also be large enough to fit the turns of the wire gauge you need. Each winding must fit in a single layer on different sides of the core with enough room to place a spacer (typically 3mm) between them. Step three: calculate the number of turns. Known requirements: 377 Ω of impedance is required at 50KHz in a circuit carrying 2 Amps of current. Required minimum inductance: To find out wire size: From the wire chart, the 20AWG has a nominal area of 1024 cmils, therefore, select the 20AWG. Overall maximum diameter for 20AWG is .0666” with a single build insulation. Two windings of 10 turns with each using 20AWG size wire will fit on a core with an ID of 0.57” and still leave room for a 3mm spacer.